The internet’s an easy thing to blame. Faceless, ethereal, piped to our homes and offices by bureaucratic corporations better known for ever-increasing bills and unreachable customer support, it’s the obvious target when something goes wrong on the computer. You can’t hear someone on a call, or the video freezes in a meeting? The internet. The movie pauses to buffer? The internet. You miss a move in a game? Definitely the internet. Instead of optimizing and improving, finding ways to eke performance out of the unoptimized, the scapegoat allows us to relax in mediocracy. If only someone else would fix the internet, everything would be right in the world. Far easier it is to assume everything would just work if everyone else did their job than to learn and improve your own systems. External limitations are convenient excuses for the status quo. They overshadow other issues, turn them into a speck in the eye to analyze and critique, somewhere else to place the blame. You didn’t leave late for the meeting. It’s the traffic’s fault; “you know how rush hour is,” and with an eye roll and a flick of the hand, personal responsibility is absolved. It’s not that your ceiling could use more insulation, or your car better maintenance; “the sun is so crazy strong here” or “you know how the salt eats the cars” and we nod our heads and chime in with our own anecdotes of similar misfortune. Until, that is, the external limitations are stripped away. The construction’s finished, the traffic dissipates, yet your arrival time is still uncertain. Gigabit fibre comes to your neighborhood, the speed improves, and the WiFi coverage is still spotty. All along, the internet speed was to blame—as were the pipes and concrete and raw space separating you from your router, the technical limitations of 2.5g WiFi, your frayed cables and cluttered shelf of random electronics. Everyone else resolved their issues. The ball’s back in your court. There’s a balance to be had, sure. For as soon as your improve your network, a faster network will be available, and you’ll have joined another mini rat race of keeping up. Maybe your speeds are fast enough, your house warm or cool enough, maybe you’ve reached your equilibrium. Zen, calm perfection. Or perhaps this is where continuous improvement comes in, where products and projects are never fully completed, only gradually improving, approximating every more closely the perfect curve. The lifelong push and pull of better and best, where today’s best is all too soon tomorrow’s better and the next day’s merely ok. Kanzen, continuous improvement in search of perfection. Either way, the focus isn’t on the external limiting factors. Perfection is to be achieved within the limitations presented. You can’t optimize a car into a rocket, and a car engineer railing against the limitations of gravity at every turn would be delusional at best. You instead perfect what’s at hand. And when the job’s done well enough, you step back and consider what’s next, what other process could be improved, what external limitation could be removed to continue down the improvement path. Otherwise you accept the limitations as they are, neither using them to excuse inaction or blaming them for limitations you’ve discovered that cannot be removed. Blame not external limitations. Use them instead to frame your optimization strategy, as a guide to perfect what can be. You might not be able to get to the moon thanks to your external limitations, so instead of wasting time and thought cycles on wishing, you can focus instead of what can be achieved. What’s a PC? It’s just another app. Need to run Windows on your iPad? Amazon has a workaround for you, with an app that is almost as good as running Windows directly on your iPad. Say you have a PC and need to run an older version of Windows or another operating system like Linux. You could dual-boot, choosing which operating system to run when you start your computer. Or, you could use a virtualization app like VMware or Virtual PC to run another version of Windows or Linux inside an app. It’ll run slower, but you can use the main version of Windows you already have installed and the other version side-by-side. Amazon offers nearly the same thing in the cloud with Amazon WorkSpaces. Instead of running the other version of Windows or Linux on your computer or iPad, though, Amazon runs it in their servers. As long as your internet connection is reasonably fast, Amazon Workspaces feels generally as responsive as a virtual PC. And it works even on devices where you can’t install Windows or a virtualization app, like the iPad. First sign up for Amazon WorkSpaces with an Amazon account. It’s free to start—you can use a Windows desktop in Amazon WorkSpaces for free for the first two months. After that, you’ll need to choose a plan from $25/month for Windows (or $7.25/month plus $0.57 per hour of usage, which works out well if you only need Windows occasionally). There are also higher tiered options with more power and Microsoft Office, or cheaper options for Linux or if you want to use your own Windows license. And you can start and stop as you need—you could have a desktop this month for a project, then delete it, and create a new desktop 6 months from now when you need a PC again, to only pay when you actually need Windows. You can choose from Windows 7 or 10 for your Amazon WorkSpaces desktop. Both are actually desktop instances of Windows Server 2008 and 2016, respectively, which look and act like Windows 7 and 10 for the most part. With Amazon WorkSpaces’ Windows 10, for instance, you’ll have the core Windows tablet features including an on-screen keyboard and the full-screen start experience if you want—both of which are reasonably nice to use on the iPad. 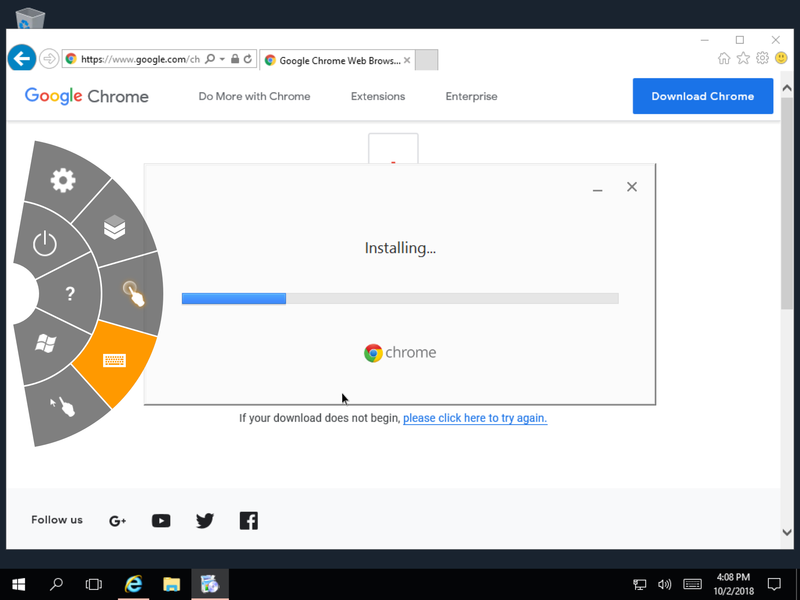 What you won’t have are most Windows consumer features—no Microsoft Edge browser (Amazon installs Firefox instead by default), and no Microsoft Store to install apps (so you can download and install any online app, but can’t install apps from the Microsoft Store). You may possibly run into other apps that don’t run on Windows Server—but for the most part, it feels like using normal desktop Windows. Amazon takes a few minutes after you signup to create your virtual desktop. In the mean time, download the Amazon WorkSpaces iPad app. Check your email, and once your Amazon WorkSpaces desktop is ready, Amazon will email you a link to set up your user account. Then use those credentials and sign into the Amazon WorkSpaces app. And with that, you’ll have a nearly normal Windows desktop experience. Use your finger as a mouse—tap where you want to move the mouse, then tap again to click (or, Amazon supports the SwiftPoint bluetooth mouse if you want a traditional mouse with your fake PC). Two-finger click to right-click; drag the scrollbars to scroll. Tap any text field to open your iPad’s default keyboard, which now will show Windows command keys along the top so you can enter keyboard shortcuts (or use any bluetooth keyboard to type—though you’ll still need those on-screen buttons for keyboard shortcuts). 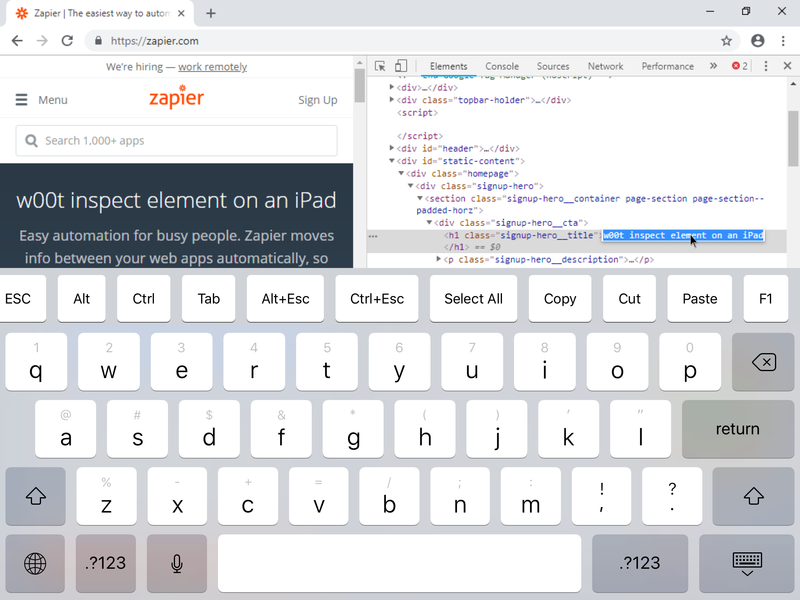 Copy text anywhere else on your iPad, and you can paste it to your Amazon WorkSpaces PC. It’s pretty seamless. Amazon WorkSpaces includes a small menu of extra features, too, if you swipe your finger in from the left side of the screen. That includes options to show the keyboard (handy if you’re using a bluetooth keyboard and need to enter a keyboard shortcut), a button to change your mouse tracking, a Windows key, and a power button to turn your PC off. Your WorkSpaces PC is connected to the internet through Amazon’s servers, so open the built-in Internet Explorer or Firefox to download any software you want. Downloading apps is fast, too—my WorkSpaces PC speedtested at over 800Mbps download, making for a quick Office and Creative Suite download. Most software I tried worked as expected, though typically the versions designed for mouse worked better than the newer “touch” versions since Amazon WorkSpaces doesn’t fully integrate with your iPad’s touchscreen. It’s not perfect, and you wouldn’t want to work all day in an Amazon WorkSpaces environment. You’ll likely find keyboard shortcuts and the slight disconnect of using a fake mouse through the touch screen annoying. But then again, it’s not that bad. If you only occasionally need PC software, and don’t have a desktop PC around to remote desktop into, Amazon WorkSpaces is one of the easiest ways to use Windows on an iPad. With a full desktop browser and the option to install any desktop apps, it’s one way to plug the last remaining gaps in your workflow that can’t quite be done from the iPad alone just yet. Want to format text? It’s insanely easy in most word processors, email apps, and anywhere else you'd type formatted text today. You type text, select it, then tap the B icon to make it bold or the i to italicize it. Need a list? There's a ☰ button for that, too. That is unless you want to format plain text. Then you'll need a bit more to make your plain text less plain. You need Markdown. Over a century after the typewriter turned handwriting into precise characters, we've collectively found the symbols and characters that work best to format plain text. That's Markdown in a nutshell—it's a simple way to format text using symbols, similar to the way you'd use symbols to add character to a typewritten document. You write text as normal, then add special characters before (and sometimes after) the word or phrase to format them. Wrap a word in *asterisks* or _underscores_ to italicize it, for instance; add two ## hashtags before a phrase to make it an H2-sized title. It does pretty well at keeping that promise. That’s all you need to start formatting text with Markdown. You can find more details in the Markdown documentation if you want to get fancy and add tables and footnotes and more. For now, though, practice makes perfect. Start formatting your text with _underscores_ and # hashtags and it'll quickly become second nature. Blank pages are scary. Terrifying, even. The longer you stare at them, the harder it gets to write. Perhaps you have nothing to say. Perhaps no one wants to listen. Perhaps, though, the only problem is that your brain’s frozen. You can’t always make yourself be creative on demand, but there are usually some ways to jar words out of your head. You know how you’d wait to complete college essays until the very last second? Or at least, that’s what I perpetually did. It was far too easy to do all the other, less difficult things first, and leave that most draining homework until there was literally no time left. It worked—with far too many close calls of submitting an assignment within minutes of the deadline and essays that were not nearly polished enough. Don’t do that. But the trick itself might still be a good idea. Say you need to write something by Friday. It’s Monday, and your brain’s apt to want to put it off. Sure, no worries. But Friday’s a bad deadline—it’s the _dead_line, the do-or-die-trying date, the one if you can’t hit, you’ll have to work late to finish. So that’s the submit date. Set another due date for your own work. Maybe Wednesday evening would be a better due date. Write it down, put it on the calendar, try your best to convince yourself that Wednesday is the due date. Then, best case, you can read over and revise it on Thursday then submit your best work on Friday. Worst case, you’ve got Thursday to wrap up the loose ends—not to write the whole thing minutes before it’s due. A fire under your feet really does work. In a similar vein, when planning stuff with others, set reasonable deadlines. Maybe you could write 4,000 words today—but there’s a far better chance you’ll feel blocked and won’t be able to write even the first thousand. Give yourself a buffer, and you can set your own earlier, stricter deadline so you still have time to deliver a polished work. The clock’s ticking, and it’s still not happening. Even with a deadline you’ve got to hit, you can’t get yourself to write. Actually, you could write something. You just can’t write the thing you’re supposed to be writing. So write something. Write a letter to yourself, pen some terrible poetry, describe your room and desk and your current state of mind. Transcribe a song, even, or some famous piece of text you’ve memorized. Retype a news article. Type random words and use autocorrect to fill in the blanks and see what you get. Get your fingers moving, words flowing.—and right when it feels normal, switch gears and try to write the thing you need. In the collection of weird tricks to overcome writer’s block, this has to be the strangest—but it does work for me. Transcribing songs, especially, helps me focus by thinking about the lyrics, gets my fingers typing fast enough to keep up with the music, and jumpstarts that part of my brain that doesn’t yet have enough caffeine to start writing. It works. In a similar vein, sometimes you need to start over—for your writing’s sake, or just for practice. Take the latter first. Perhaps you’ve already written something you like, something finalized, published even. You already know what goes into it, the thesis, story, and how it all fits together. That’s a great thing to work with. Take the essence of the thing you’ve already written, and write it in another way. Retell the story. Don’t just move words around—pick new words to tell the same thing. You might accidentally end up with something great. Just as likely, you’ll end up with some ok copy that you’ll throw away—but it’s copy that gets your brain ready to write the thing that needs written. Or grab something that hasn’t been published, a piece you’ve sat on forever since you can’t figure out how to say it. Again, don’t edit—recreate. Read just enough to refresh your mind about what you’re trying to say, then switch to a blank page and try to write it anew. It’ll be easier to start writing—you already know in general what to say, and the stakes are low or non-existent. Before long, you’ll be in the flow, ready to write whatever you need. Or maybe you should keep rewriting. After all, the bits you were struggling to write before are likely not your best copy. Time to rewrite those same thoughts another way. This one won’t get you typing as much, but it works the same memory muscles. When you’re stuck and don’t know what to say, fix the things you’ve already said. Your writing needs edited. Everyone’s does. It’s hard to see your mistakes and extraneous words while writing, but they become glaringly obvious if you read through them carefully. Mistakes become more obvious with time. Somehow when you’ve first written something and the story’s still fresh in your mind, it’s easier to overlook the mistakes you’ve typed (for me, anyhow). Look over what you wrote yesterday, though, and the mistakes will be obvious. So do that. Use the time you can’t write to improve what you wrote before. Thinking through the word choices and grammar and commas will get you working on something, anything, and it’ll be far easier to switch gears and actually write. Face it: Sometimes you simply can't do the thing you set out to do. Staring at the blank screen isn't helping; writing random stuff isn't doing the trick either. Time to switch gears and do something else. Perhaps the one thing that helps me stay productive the most is multitasking. No, you shouldn’t write more than one thing at the very same time. But you likely should have more than one writing project going on at once. You can’t be your most productive on one specific project all the time, but you likely can be productive on something all the time. So switch things up and work on something else. Maybe you’re supposed to write a blog post today, but it’s just not happening. Switch over to your documentation and work on that instead. Email’s a distraction, perhaps, but if you have things to answer, perhaps that’s the writing you should do. Queue social posts. Outline your next chapter. Do something that keeps things moving forward in general, even if you can’t move this piece forward just yet. Maybe it’s only this one section of the piece that’s proving troublesome. Stuck on the intro? Write the conclusion instead, or some point in the middle of the piece, or a scene you can write right now. Or do a different task. It might be time to work on a design or dev project instead, to take the trash out and wash the dishes. There’s stuff to be done, and if you can’t do word tasks, do the stuff you can do without thinking as much. Writers’ block is a real thing—or at least, there will always be times when you can’t figure out what to write. Your fingers could type, but it’s far easier to stare at the blank page and blinking cursor instead. So start doing something. Type anything, and you’ll get into the rhythm of writing again. Maybe you still won’t be able to write the piece you started working on—perhaps that piece isn’t to be. But odds are you’ll get started writing something, perhaps that next great thing you’ve been waiting to write. Along with delays and paperwork and jetlag, one tiny tech annoyance pops up almost every time I arrive in a new country: Google changes its language. It’s a helpful feature if you speak the local language, but a widely confusing one when you’re half asleep and want results in English or another language you prefer. But by default, most of the time you open Google in a new country, the results will show up in that area’s language. You can select to switch to English and your browser will remember your choice—but if you use an Incognito window or a browser like Firefox Focus (which, by the way, is my new favorite way to quickly Google stuff), Google will default to the local language with every new search. The %s is what your browser will replace with your search query; the us is the region/language you want, here US English. Want results in Spanish? Replace the us with es for Spanish results for Spain. th gets Thai results, cn Chinese, and so on. You could instead specify a language, using the &lr=lang_ modifier instead, such as &lr=lang_en for English or &lr=lang_fr for French. That changes the language, but not the region, to help you get localized results in your language. Though for whatever reason, the gl options tend to work more reliably for me. Either way, that should get your Google results in the language you want, no matter where you are. Find more ways to customize your URLs with Google’s full search URL modifier documentation. Having the entire internet in your pocket is magical when you stop to think about it. But what makes it even better is that you can share that internet connection with your laptop or others around you. It started out slow, with tethered dialup over cellular on older Nokia phones. Today's phones are much better, turning a 20+Mbps 4G signal into Wi-Fi that's plenty even to stream movies on your TV. It's how I stay productive when my home internet's down—or coffee shop, airport, and coworking Wi-Fi is overloaded—and one of the easiest ways to save money on internet when traveling. A chapter a day adds up to quite a number of books a year—only, exactly how many I never really tracked until early 2017. I'd opened Goodreads, was prompted to add a reading goal for the year, and went back to see how many books I'd read in 2016. Lo and behold, add in paper books, and I'd likely read 20 or so volumes in the year. I could do better than that. Suddenly I had to read 30 books in 2017. And so I kept reading as normally, a chapter here, a book there on longhaul flights. Pages added up and the goal felt realistically achievable even without reading a crazy amount every day. That is, until Ta-Nehisi Coates listed his favorite Civil War books—and Battle Cry Of Freedom jumped out as one I should read and add to the 25 or so I'd read already. Great idea—only Battle Cry Of Freedom is over 900 dense pages long, enough that Kindle kindly suggested it'd take me over 25 hours to read the whole book. Suddenly the goal of thirty books in 2017 was less achievable. Everything in life begs to be quantified. It started in the workplace, with key performance indicators and net promotor scores and daily active users being the deciding factor in every thing we do. Sure, we can talk about the things we can't measure being most important—but it's hard to live by that with the graph's trending downwards. Smart devices and social networks brought that to our personal life to an unprecedented degree. Suddenly everything could be tracked. We knew we should stay active—but now we knew if we didn't walk 10k steps a day, and we'd try to exercise just to fill in those rings. We knew a weighty volume would take a while to read—but now we were told up front how much time it'd take (and our friends would automatically be told when we finished reading it). We hoped we were popular with our friends—but now we could see exactly which jokes fell flat, which photos people actually liked, and who was more jealous of us than happy for us. Everything turned into a numbers game, so much that you might choose which food to order based on how many Instagram likes it'll get, or try to listen to more indie tunes to look cool. Exercising at home? Nah—much better to run at a park so you can track it and keep your spot on the exercise app's leaderboard. It's not all bad. Exercise apps push many people to work out more than they would otherwise, social networks do make it easier to stay in touch and have helped many hone hobbies or careers, and so on. It's that the numbers aren't all that matters. In fact, numbers don't matter at all. The goal is all that matters. So take apart your goal. Want to read 30 books this year? Or what do you really want? Perhaps you want to learn more things, to read more from your favorite author, to expand your reading into subjects you're less familiar with. You might want to read more, read better, keep reading regularly—and the number can help. If the raw number of books is all that mattered, you could raid the kid's section of a bookstore and get your thirty books read in an afternoon. But the number's not the goal. Or, at least, it shouldn't be the goal. You get what you measure. Strive to read a specific number of books—or to get a number of visitors to your site, or to make a specific number of revenue—and you might hit that at the loss of other metrics you're not tracking. Maybe you'll choose to read less impactful books just to read something. Maybe you'll cut back on customer services, make worse products, make false promises—all could offer short-term revenue gains with far greater long-term losses. The Battle Cry of Freedom taught me more than most of the books I read this year. It nearly kept me from my raw number goal—but it more than achieved my unstated goals of learning more through reading, expanding my viewpoints, and reading a wider variety of content. It was well worth nearly missing a number goal for the greater good. And so it goes in the workplace, too. Set goals and metrics at the beginning of the year or quarter—but always keep in mind the value behind the goal. Is more visitors really what you want—or would more engaged readers of your blog be more value? Is new blog posts what you need, or would your time be better spent updating the older, more valuable content you already have? Should you make a new sell, or help keep an existing customer happy? In the end, I finished my reading goal with a little extra effort. Metrics are hard to shake off. But it taught me, as other lessons from work in 2017 had as well: Don't just make your goals numbers. Make a better goal, something greater you wish to achieve. Then stick a metric to it as a guidepost to help you know how you're doing. You might surpass the metric, or your might come up short, but deep down inside you'll know if you actually hit the real goal or not. Such goals are harder to quantify—but far more valuable. Technology has this habit of working great until you really need it to work—at which time it casually decides to take the day off and forget how to do what you need. Or so it seems. Batteries are perhaps the worst, today’s printers and annoying ink cartridges. They’re the one thing most likely to turn our gadgets into expensive paperweights. And last winter, my phone’s battery was doing just that. We’d gone to Osaka, Japan, which at something around 0°C felt rather cold to our group of Bangkokians. After a red eye flight and a few false turns on the train, we’d finally gotten in the vicinity of our AirBNB. All we needed was Google Maps walking directions for that last 500m through the biting wind. Which is exactly when my iPhone 6s+ battery decided it, too, didn’t care for the cold. Google Maps pulled up the directions, we set off walking, and I stopped to take a picture of manhole cover (which turned out to be the real world Pokémon, with uniquely beautiful ones popping up everywhere we went). Switch back to Maps for the next turn and... blackness. My iPhone had gone from a reasonably charge to dead in an instant. That became a recurring theme that trip. Out of 6 people all with various iPhones (aside from one Huawei), mine was the only one that shut off randomly in the cold. The battery was generally ok, working as normal in warmer weather. I was the only one without a case, leading to the assumption that cases helped keep phones just enough warmer to survive. Perhaps—antidotally, this fall the same phone with a case fared fine in Chicago wind and rain, though that was never below freezing. All of us had seen phones with older batteries shut off randomly under 20% or so of charge—but since the battery worked fine out of the cold, that didn’t seem the same issue. My own pet theory was that batteries like people acclimate to climates, and mine was just used to the heat and humidity of Bangkok. That was before iPhone battery issues were in the news—and while Samsung’s exploding batteries were still being warned about before flights. And once it came out that Apple was slowing down phone CPUs if the battery was dying, everyone who’d ever thought their phone magically felt slower after a new phone came out felt vindicated. After all, old batteries would just last less long—why slow the whole phone down if not for more nefarious purposed? So here’s a data point on the shutdown side. It was crazy annoying, and basically meant my phone was useless right when we needed it most in the middle of getting directions. And Google Maps is resource intensive—note how much it heats up your phone—so it seems to make sense why that app would be the one that triggered the shutdowns. There’s no perfect solution, but if there had been an option to slow the phone down and keep it from turning off, I’d have used it in a heartbeat. The problem here is communication and control. Apple did a great job of communicating about the issue now after it hit the news, explaining battery chemistry and the tradeoffs involved. Cheaper iPhone battery replacements are a nice touch—one I hope Apple randomly decides to extend indefinitely, as unlikely as that is. The problem is in the timing. People have certain expectations from their devices—that they’ll work reliably and not age unreasonably fast—and Apple, perhaps, is held to a higher standard with their device price and premium brand. Balancing that is tough—do you let the phone shut off randomly if the battery can’t give enough current, or do you slow the phone down so it keeps running albeit crippled? So own it. Communicate. Let customers know what’s going on, what to expect. Hide it in documentation, even, if you don’t want to draw too much attention to it—but work in public, and set appropriate expectations. And, perhaps, let people have control. Low Power Mode is brilliant because it saves battery if you want it too. Bundling the slowdown with that might be reasonable—as would recommending low power mode at a far higher percentage if the battery’s dying. There’s a lesson for the rest of us. All products have flaws. It’s inevitable, something anyone who makes any item must face. And our first inclination is to clam up and shy away from the issue. You’re holding it wrong, using it wrong, it’s better to not have that feature, we know what’s best, trust us. Maybe you the maker are right, maybe you do know best. Folks only want a faster horse, after all, not motored future. But your horseless carriage for all its bells and whistles will have issues, will require fixes and workarounds your users may not expect, will have something you overlooked until it becomes an issue. The best thing you can do is pull back the curtain, break the spell, and let people know. Be honest. Document your product’s limitations. And perhaps go above and beyond in fixing things that are only partly your fault. It might hurt in the short term but will win you loyalty in spades over time. The moving walkway is now ending. Please, look down. Airports are hardly the place for peaceful introspection, with the bombardment of sounds and signals designed to rush you along to your next gate while convincing you to spend far too much on a bottled water and a bestseller-yet-terrible business book. And yet, there’s magic to the madness—in the best airports, at least. Like it or not, it’s impressive how you can arrive in a new city anywhere on earth and find your way from gate A5 to E14 (a gate you only found by consulting the departures board upon arrival) in a half hour, typically without consulting a map or app even in a jetlagged haze. Instead, you go with the flow. The general mass streaming towards the center of the airport guides you without much thought; from there, signage leads you to the next terminal and concourse and gate almost automatically. There are exceptions and terrible airport layouts to be sure, but a combination of affordances and signifiers augment your reality and help you navigate an unfamiliar terrain without much effort. That’s the beauty of architecture. The instagrammable rafters and glass walls are merely decoration; the forgettable and utilitarian entrances, hallways, stairs, and hidden conduits are where the building comes to life. They’re what help you instinctively navigate a building, find your gate, grabbing a drink and battery recharge along the way. Picture a wide concourse, lined with duty-free shops and restrooms, with a moving walkway in the center and signage overhead. That forgettable ad for AWS might grab your attention for a second—but the sign for Terminal B or the warning to not exit unless you want to go through security again get quickly seared in your mind. And 99% of the time, you’ll know to push or pull or simply walk towards a restroom door without thinking about it. Why? Affordances. The concourse and doors both contain affordances, things that tell us intuitively how we can interact with them. A long concourse with walkways down the center and gates off to the sides is an obvious way for us to walk; a narrow path sealed off behind closed doors screams “Do not enter” even if there’s no sign to that effect. Once glance at an environment, and we typically know if we can proceed or not (true both in nature—a wide-open field looks more inviting than one covered in thorn-bushes and vines). Door handles are often the same; handles protruding from the side of a door typically mean we should pull it, while a bar along the width of the door typically means to push it. There are poorly designed doors that break the norm—and risk you accidentally running into a door you thought you could push—but by and large, the norms hold. They’re affordances we’ve learned. There’s no specific natural reason we must make door handles like that, but we do, and so we continue to do so to take advantage of humanity’s general understanding of that affordance. Signifiers—or signs, for a more common term—are a bit trickier, with both affordances to make them grab your attention and new information we must stop and process. Take the departures board or screen. We know one should exist and that it should be a wide rectangle with a list of flight callsigns and times, typically hung at or above eye level—all learned affordances. Once we find it, we must stop, find our flight either alphabetically or based on time (something we figure out automatically after looking through a few flights), then start looking for the next signifier: Terminal and gate signs with their own shape, size, and color affordances along with text and symbol information. Could we find Gate E4 by walking past the first 4 terminals before entering what we’ve decided is terminal E, then walk past the first 3 gates before stopping at the fourth? Perhaps. Signifiers are a shortcut, though, a quick way to share information. Both affordances and signifiers require simplification. A half dozen handles to let people open doors however they want would help no one; neither would a lengthy sentence describing terminal E. We trim down, give the least information possible in the most generally understandable way, and trust most people will figure things out. Architecture requires a surprising amount of information. The broad themes make themselves obvious—few have trouble navigating a well-designed concert hall—but a bit more effort is needed to make sure fire extinguishers and exits and restrooms are easily discoverable. And information requires a surprising amount of architecture. The way you know how to flip through a book, find a word in a dictionary, jump to the conclusion of a story all are thanks to affordances. The text on a book’s cover tells you intuitively how to open it, the order of the alphabet helps you know to open the first 1/4th of the dictionary to find words beginning with E, and the default intro/narrative/climax/conclusion order of a story helps you know to go 3/4ths of the way through an article to find the ending. They’re learned affordances. Or you can make new ones. Old dictionaries and family bibles include indentions to mark sections; newer travel guides might have a darker color printed near the edge of pages for a similar goal. Or add signifiers—headings, italics, block quotes, blank space, page numbers, outlines, all things that help people find their way through your text. Put a table of contents in the front, a menu on the top of your webpage, footnotes at the bottom of a page. They’re how we organize—architect, even—information. Information Architecture the study of how we arrange information to create meaning, to fight the entropy and confusion and information overload, to make straight the way. It’s how we take a random group of words, a few abstract concepts seemingly unrelated—pure disorder, the written equivalent of entropy—and turn them into something informative, instructive, new knowledge from the combination of the old. It’s how Wikipedia sends you on a rabbit trail of knowledge, how YouTube guides you through the process of uploading a video, why you know to check the bottom of an article for comments. Perhaps it’s not as involved as real architecture, but it’s a part of your daily life nonetheless. And it doesn’t have to be exotic, the work of designers and bookbinders and Wikipedia editors. It’s the ordinary information architecture that strikes me as most fascinating, useful, needful. Take a book. Your earliest lessons in narrative writing taught you to that to write, you first must break your ideas down. Outline them. Tell what you’re going to tell, then tell, then tell them what you told. Rising action, climax, falling action. Structure. That suited your earliest stories—and generally maps the broad themes of most written material—but it never quite told you how to write well. If anything, it taught you to be repetitive and to stretch an otherwise short idea. What’s actually needed is textual wayfinding, signifiers and affordances in your text that help readers navigate your idea. Explain unfamiliar concepts just as an airport adds detailed info signs near immigration lines. Some things need defining right when you get to them. Breeze past other terms—they’re the equivalent of gate numbers that need pointed out but not expounded on. Order your thoughts logically, building one thing on another. Don’t jump ahead of yourself. In fact, that’s the best reason to have someone else proofread your text—they’ll notice text and logic jumps that feel less obvious to your mind. And if there’s something you think readers may be partly but not fully interested in—a list of ten best items, say, where someone might read a couple of the entries—include outlines and headings to make them easy to navigate. That’s the information architecture you need to practice every day, thinking through your content as though it’s a grand hall. Is the stage clear, or cluttered with random items? Do the decorations accent the stage and add to the ambiance, or are they distracting extras? Are the exits clearly marked, the seats ready for your reader to enjoy the show? Are the paths made straight? Only then is writing well architected. Ever wondered where web apps came from, why we quit having to install apps from a floppy (or CD, or even an App Store) and instead could just open the app right in your browser? We did too. And over the past 2 years, we've read books, dug through old websites in the Wayback Machine, uncovered ancient discussion threads, and found five of the earliest web apps. There's an early online maps tool from Xerox, the wiki that anyone could edit years before Wikipedia, an online form and accounting tool that saved a university millions, a security too with a logo designed by Neil Gaiman, and the eCommerce tool that went on to power Yahoo! 's stores and provide the capital for Y Combinator.